Three Indian naval vessels were luckily in the region and able to respond rapidly to the devastation of Cyclone Idai. Cyclone Idai, which struck Mozambique in the early hours of March 15, has since been in the news as the worst natural disaster so far in 2019. The Category 4 tropical storm made landfall at the port city of Beira, and resulted in more than 400 deaths. The accompanying rains and a four-meter storm surge displaced hundreds of thousands of people. The impact of the cyclone has also been felt further inland in Zimbabwe and Malawi. Reportedly, Beira continues to be without power and accessible only by air and sea. 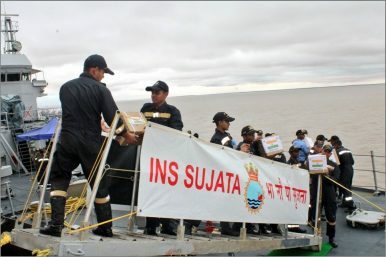 In a fortuitous sequence of events, three ships from the Indian Navy’s First Training Squadron, INS Sujata, ICGS Sarathi, and INS Shardul, were operating in the region, presumably on a training mission. They were diverted immediately to render assistance requested by the government of Mozambique. The ships, which reached Beira on March 18-19, were the first to arrive on the scene and immediately became involved in humanitarian aid and disaster relief (HADR) and search and rescue (SAR) operations, in collaboration with the local authorities. Evidently, Indian naval ships on overseas deployments are mandated to carry additional HADR kits for such contingencies and thus the ships were well prepared to undertake relief work. The ships, largely manned by young cadets, were able to employ their boats and helicopter to rescue nearly 200 stranded people and distribute food, water, medicine, and clothing. A makeshift kitchen provided hot meals for rescue workers and others, while medical teams from the ships attended to over a thousand casualties. According to the latest reports, a larger Indian naval ship, INS Magar, has already been sailed out to augment the HADR efforts. Meanwhile, China, the EU, the United States, and some African states and international organizations have pitched in funding and support for the ongoing HADR operations and rehabilitation efforts. The timely assistance by the Indian Navy in the aftermath of Cyclone Idai and the professionalism displayed by the naval personnel have been praiseworthy and will help to foster India’s relationship with Mozambique. Beyond India’s relationship with Mozambique, the role of the Indian Navy adds credibility to India’s ambitions to be a regional net security provider and also helps to promote India’s goodwill and influence in Africa. The Indian Navy has long played a key role in providing maritime security for Mozambique and other regional states. For example, in 2003, at the invitation of the Mozambique government, the Indian Navy deployed ships off Maputo to help provide maritime security for the African Union summit, repeating the operation in 2004 when Maputo hosted a World Economic Forum meeting. Significantly, in 2011, Mozambique signed a maritime security agreement with India. While specific details were not released to the public, it is likely that the agreement provides privileged access for Indian naval ships to Mozambique ports. India has established similar wide-ranging bilateral maritime security ties with other regional states, including Mauritius and the Seychelles. Yet, India, unlike China, has demurred from leveraging its diplomatic ties to establish a regional naval base at any location in the region. This could hamper India’s efforts to play a larger role in the regional maritime security. It is no secret that China has been competing with India for regional influence in the Indian Ocean region, but pertinently, in this case, People’s Liberation Army Navy (PLAN) ships seemed to be conspicuous by their absence. What if the Indian naval ships were not present close to Mozambique for immediate deployment and larger and more capable ships such as LPDs (Landing Platform Docks) from the PLAN, operating out of their new Djibouti naval base, happened to be operating in the region? Clearly, China would have made full use of this opportunity to strengthen its own diplomatic position in the region and build an image as an alternate security provider. In the long run this could dilute India’s image as the primary net security provider. Importantly, China’s economic and political influence in Africa is expected to intensify further, commensurate with the coming wave of investments under the Belt and Road Initiative. Increasing Chinese investments and the presence of a growing worker population will invariably call for a greater naval presence, facilitated by the PLA naval base at Djibouti. Additional bases at Comoros and Tanzania, with whom China’s defense cooperation has intensified, seem likely. Obviously, these developments would support the PLAN in playing a larger role in the region. What does this mean for India? In order to retain its position as the net security provider for the Indian Ocean region and to add force to its diplomatic efforts, India will have to enhance its presence in the region. Perhaps, the time has come for India to cash in its goodwill in the region and establish naval bases in the eastern Indian Ocean to fulfill its role as the regional net security provider. Dr. Shishir Upadhyaya is a former Indian naval intelligence officer with a Ph.D. in International Relations and Security from the University of Wollongong, Australia. India sent three naval vessels to deliver humanitarian assistance after a recent tropical cyclone hit Mozambique.